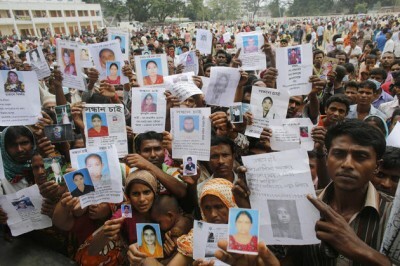 Workers in Bangladesh have been perishing in tragic, preventable factory accidents for years. Now, in mass uprisings that portend both more violent labor struggles on the horizon and a new dawn for a nascent labor movement, the workers are starting to strike at the factories themselves. Tens of thousands of workers took to the streets earlier this week, turning some of their anger at the factories by hurling broken bricks at the authorities. About 300 factories were shuttered“to contain the violence,” according to Al Jazeera, and police cracked down on protesters with “tear gas and rubber bullets.” In lashing out at the physical workplaces, the workers were responding to symbols of a power structure that has done far greater violence to them: Just this spring, more than 1,100 people died in the collapse of the Rana Plaza industrial complex, and before that, scores of lives were claimed in a blaze at the Tazreen garment factory. While the Rana disaster was a catalyst for the uprising, the workers’ primary demand appeared to be for higher wages. Advocates want long-term compensatory payments from the employers and brands who were supplied by the factories. Based on the model used for previous Bangladesh factory disasters, the global union IndustriALL estimates that fair compensation would total $74,571,101 for all workers and families affected by Rana Plaza and $6,442,000 for those affected by Tazreen. The compensation fund would be linked to a major fire and safety accord based on unprecedented legally binding safety standards, which 87 apparel brands have joined so far. But IndustriALL officials announced that little progress had been made in the last round of compensation fund talks earlier this month. “No such agreement was reached at this meeting, although the brands present committed to continuing discussions on this issue,” said a press release. And considering the income differential at opposite ends of the supply chain, a long-overdue raise for the world’s poorest workers shouldn’t be a deal-breaker. “They are sewing for the largest apparel brands and retailers in the world who can easily afford to pay more,” Foxvog adds. Then again, the companies that have signed onto the safety accord did so in large part to avoid the negative international publicity that followed the deadly factory disasters. So it may be that global consumer pressure, rather than local labor strife, is the most effective lever to change in the industry. Nonetheless, real labor change can only be sustained if labor unions and civil society are empowered to defend any gains in pay or safety protections. The rage that now pulses through the streets of Dhaka sends a powerful message to both consumers and corporate CEOs in the countries that profit from the drudgery of Bangladeshi workers. When a factory can turn into a death trap in an instant, they might as well turn the street into their battleground.